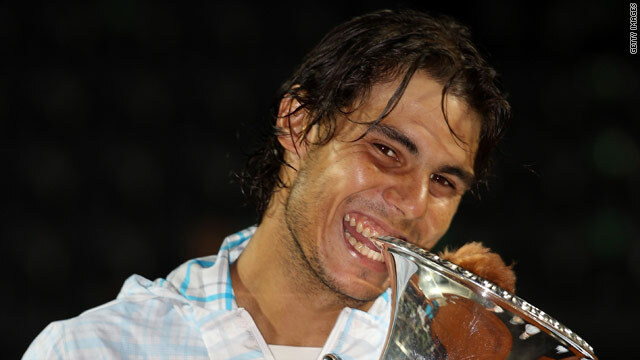 Nadal was getting his hands on a Masters title for the 17th time with his Rome win. (CNN) -- Rafael Nadal won his second straight Masters title on clay with a 7-5 6-2 win over Spanish compatriot David Ferrer in a rain-delayed final in Rome on Sunday. The world number three, who claimed the Monte Carlo title last month, was winning his 17th Masters crown, equaling the all-time record held by Andre Agassi, who was 34 when he won the last of his titles. Nadal is still just 23 and returning to his best form after a 2009 ruined by injury, losing his French Open crown after suffering a shock fourth round defeat to Robin Soderling at Roland Garros. "I hope to improve this record but you never know when you will stop, that's the good thing about sport," Nadal told AFP. "I'm 23 and I'm very happy about how I've done these years. For me 17 is a very important number but in one week we have the Madrid Masters which is another one and I'll try to keep winning. "But these tournaments are very difficult because they have all the best players in the world." Sunday's final stretched over four and a half hours at the Foro Italico, beset by showers which caused the players to endure two lengthy delays. The pair were tied at four games all in the first set with Ferrer 40-15 ahead on his own service when the heavens first opened. On their return, and with both going off again in the middle of the second set, the 13th seed Ferrer won just three more games. Ferrer, who was bidding for his first Masters title, was increasingly outplayed by Nadal, who has dropped just one set on clay this season. Nadal, who was only troubled in beating Roger Federer's conqueror Ernests Gulbis of Latvia in a three-set semifinal, made no mistake in wrapping up a timely victory as he prepares for the second grand slam of the season in Paris. "It's my first final in Masters Series and I'm happy with my season," said the beaten Ferrer. "This year has been important for me for my confidence."